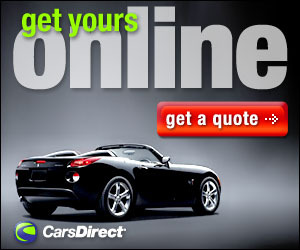 We learned a few lessons in the past few years of working in the automotive field. One of the biggest lessons perhaps is that we do not like the Prius; it’s not all that attractive, not anything near quick, or even comfortable. However, it is a hybrid, gets over 50 miles to the gallon and (sadly in our opinion) is thought by many to be the future of motoring. We’ve also learned that people will buy a Prius no matter what they look like or how they drive or how uncomfortable they are. Like lemmings being led over the cliff and into the sea the lure of saving money at the pump has a strong pull. Another lesson we have learned as well is that there are alternatives. We have driven some much nicer hybrids, Ford, Toyota and Lexus come to mind. There are also diesel variants that have become just as attractive and can save money at the almighty pump. It’s already been well established that diesel engines have better fuel economy, lower emissions and maintenance costs, finding one can be a bit difficult though. 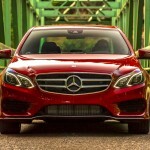 Mercedes is among the automakers however that offers a diesel engine. 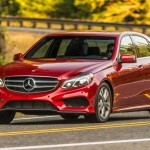 Mercedes is a lot of things to a lot of people.There are the high-powered luxury sedans that seem to thumb their Mercedes badged nose at people, mind-blowing machines that can rocket down the road plastering the smile on your face and vehicles with a very capable diesel engine. We had one a couple of years ago. The GLK250 crossover we had for a week gave us a better understanding of how well someone could live with a diesel engine, even a small one. So when told we would have the 2015 E250 BlueTEC for a week recently we knew it would be an enjoyable one. 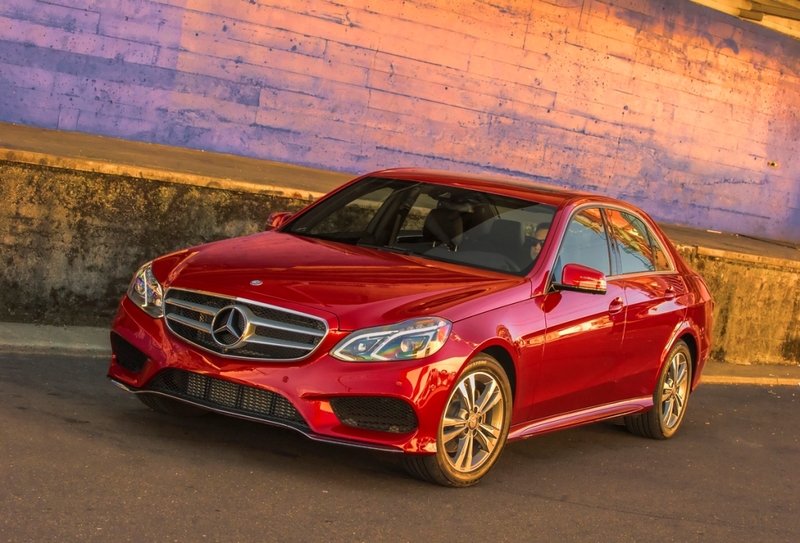 The E250 BlueTEC is Mercedes’ mid-size sedan powered by a 2.1-liter 4-cylinder turbodiesel (smaller than the 6-cylinder from last year which was the only real change from 2014). 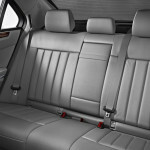 It’s available as a rear-wheel drive or 4-wheel (4MATIC) drive variant. 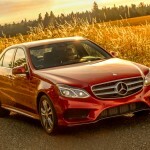 Unlike the upper classes in the Mercedes lineup, the statement here seems to be conservative. There is a luxury, but not overly so, there is comfort but it’s not too plush. 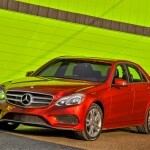 The quality Mercedes is known for is certainly evident everywhere as is many of the standard options one expects. Those standard features include collision prevention with autonomous braking, the media interface (although the once standard satellite radio is now an option), the easy to read color instrument cluster display, Bluetooth, power adjustable front seats, including lumbar adjust and 3-position memory, power tilt/sliding sunroof with one-touch open/close and power windows with express up and down. 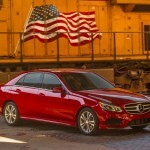 As is true with all Mercedes there is a long list of options that can bring up the price from the base MSRP of $51,800 although not overly steep. Our model had heated front seats and the Premium package ($4380) that added the COMAND nav system, voice control, the satellite radio, power rear-window sunshade, the Bang & Olufsen surround sound system and a rearview camera. We also had the sport package which gave us 17-inch wheels a lowered sport suspension and body accents ($875). Finally, we had the lane-tracking package ($1290) with lane keeping assistance (which we don’t like truthfully) and blind spot monitoring (which we like truthfully). The PARKTRONIC system with the parking assist and surround view camera rounded out the list bringing our model to a still-affordable $59,990 (with a $995 destination and delivery fee). 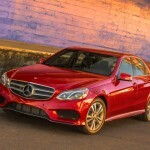 The story here is that the E250 is a very good car (with the emphasis on very). The 195 horsepower may not seem like much but when combined with the 369 lb. ft. of torque the power is more than adequate for everyday driving. The AIRMATIC air suspension allows the 4200-pound machine to glide over the road and hold curves with confidence. Sure, there are a few minor areas we were less than fond off. The ECO mode which turns off the engine at stoplights will always be one unless you turn it off every time you start the engine, and the numbered keypad is a bit annoying, but none of that takes away from the overall pleasant experience that the E250 delivers. 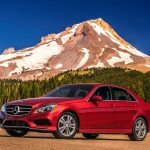 As we learned with the first experience with the Mercedes diesel, there is no odor, no loud knocking some might associate with diesel; in fact there’s seemingly no difference from a gas powered engine. With one noticeable exception; the EPA estimates the fuel mileage at 28mpg city, 42 highway, and 33 combined. We got closer to 40 mpg during our week in mixed conditions, something that is nearly impossible to get in a purely gasoline powered engine. 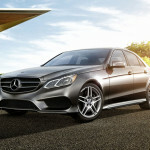 With Mercedes luxury, quality and craftsmanship the E250 delivers a great driving experience. The diesel won’t rocket you down the road, but it will allow you keep some of your hard earned money in your wallet and out of the fuel tank. Maybe the mileage isn’t on par with the Prius, but unlike the lemmings being led to the sea, you can actually save money at the pump and do so in style.